There are 26 bones in the foot. These bones support our weight and allow us to walk and run. Certain activities or injuries can cause a fracture, or break, in one or more of these bones. Pain, swelling, redness and even bruising are signs of a possible fracture. 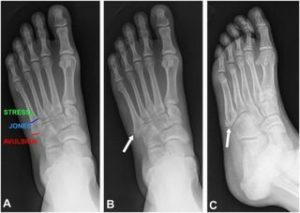 Fractures of the foot can be diagnosed by x-rays or other studies. Our Peoria AZ Foot Doctor and Ankle Specialists foot and ankle surgeon can determine the best treatment course. Rest, icing and immobilization are often the treatments; however, surgery is sometimes necessary to repair the fracture.